New data from the World Health Organization (WHO) show that four of the world’s 20 worst-ranked cities for air quality are in Nigeria (at least among cities of more than 100,000 inhabitants that monitor their air quality). Onitsha, a densely-populated commercial center in Nigeria’s east, had the worst air quality tested, judged by the annual mean concentrations of particulate matter (PM10). 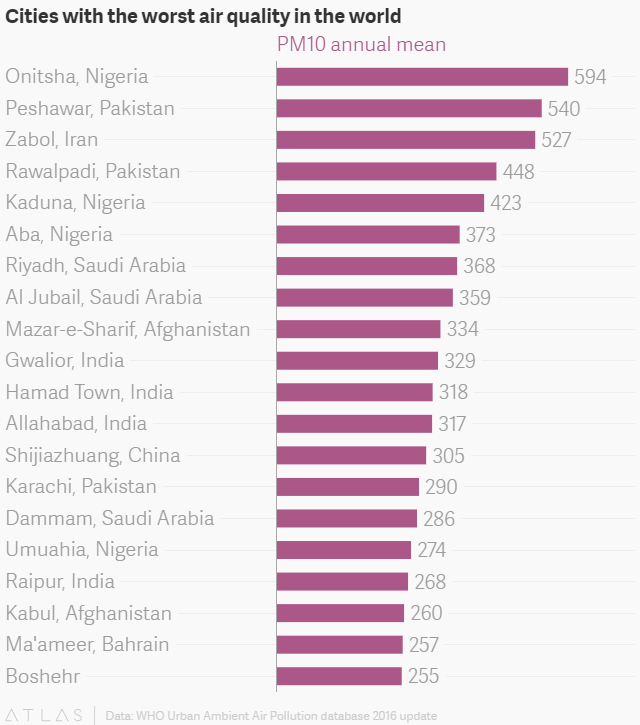 Onitsha recorded 30 times more than the WHO’s recommended levels of particulate matter concentration. Three other Nigerian cities—Kaduna, Umuahia and Aba—also feature on the list of the 20 worst-ranked cities. Two of those, Aba and Onitsha, are manufacturing cities in the industrial hub of eastern Nigeria. The list is dominated by cities in South East Asia and the Middle East. India, Iran, Pakistan and Saudi Arabia each have three cities on the list, while Bahrain and Afghanistan have two each. China, with well-documented air pollution problems, had only one city, Shijiazhuang, on the list. Around the world, the WHO says air pollution has risen by 8% over the last five years in the cities tested, with urban air quality data showing that 98% of cities with over 100,000 inhabitants in low and middle-income countries fall short of recommended guidelines. Among high-income countries, 56% of cities do not meet WHO recommended guidelines. For governments, fixing air pollution problems is crucial, as poor air quality increases the risks of heart and respiratory diseases and lung cancer. Estimates peg annual deaths caused by air pollution at 5.5 million—more than any other environmental risk.